I have always loved Veterans Day. As a military spouse of more than forty years, I've seen public support for the military community ebb and flow over these decades of peacetime and war. Veterans Day, though, has remained a constant, a day to pause and honor the service of the eight percent of Americans who have worn the uniform. Having spent nearly all of my adult life surrounded by these men and women, I can say without hesitation that their commitment, honor, and selflessness warrants that recognition. Their service is truly a debt we cannot repay. When those service members hang up the uniform, whether after four years or forty, they continue to serve as a force for good in our businesses and communities. Companies seek out veteran talent because they have seen that veterans are disciplined, loyal, hard-working leaders. Beyond their professional lives, research has shown that veterans are more engaged in their communities, volunteering, voting, giving to charity, and attending public meetings at higher rates than non-veterans. My experience, however, has shown me that the value our veterans bring back to their post-military communities and careers is paralleled by one other group: military and veteran spouses. Military spouses are now sought out by savvy recruiters who recognize their inherent value. Like their service members, military spouses understand how to put the greater good before their own self-interests. Certainly, they have diverse backgrounds and wide-ranging skill sets, but as a group these spouses are united by a shared military community experience that lends itself to building independent, adaptable fast learners. Present-day military spouses are benefitting from advances in technology that make teleworking more mainstream. This allow spouses to remain loyal to an employer through multiple moves, which is prized by employers at a time when millennial job seekers are increasingly choosing to change jobs and companies every few years. I recently heard Eric Eversole, president of Hiring Our Heroes (HOH), remark that any company whose veteran recruitment program does not also specifically extend to military spouses has "half of a military recruitment program." It's exactly that sentiment - that employers should seek out this incredible talent pool that these military spouses represent - which makes me so proud to be working with HOH. For more than five years, HOH has been working within communities and on military installations across the globe to connect businesses of every size to skilled job seekers from the military community. 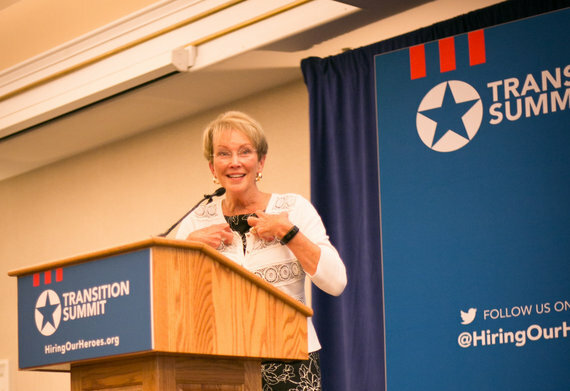 Earlier this year, which HOH declared the Year of the Military Spouse, I was honored to join HOH as an ambassador for the program, helping to connect service members, veterans, and their spouses with meaningful careers through in-person and virtual hiring events and online tools such as resume builders ResumeEngine.org and MyCareerSpark.org. Military spouse job seekers, like their veteran counterparts, aren't in need of charity or pity. They are skilled, experienced, resourceful, and dynamic. What they do need is opportunity, the chance to demonstrate their loyalty and value to employers. I'm proud to be a part of making those connections for our military community. This Veterans Day, as we not only reflect on the service of our veterans but also celebrate all that they continue to do for our communities, let us also remember the military and veteran spouses who have served, and continue to serve, alongside them. My Career Spark is a unique tool aimed specifically at helping military spouses find meaningful careers. I'm looking forward to championing this platform and will be sharing it with military and veteran spouses around the world. If you're in the area, please join me at the Hiring Our Heroes Joint Base San Antonio Military Spouse Career Event on December 1st and 2nd in San Antonio. Spouses in attendance will have the opportunity to engage with community and base leaders, veteran and military spouse-focused service organizations, and local and national employers committed to hiring military spouses.